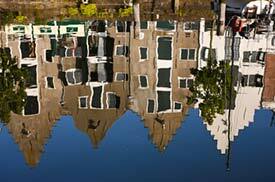 ABOVE: Amsterdam canal houses, as seen in a canal. This outstanding site has plenty of useful information for tourists and expatriates alike. The city's official English-language site has information for tourists, business travelers, and current or propective residents. You'll find a little of everything at this first-rate site, from hotels and restaurants to "redlights" and user reviews. This is a good introduction to Amsterdam, with plenty of information on all the basics. The Prinsenhof, a budget hotel, prepared this guide for younger travelers. This guide has general advice plus an extensive section on Amsterdam's "naughty bits." The site that once positioned itself as a guide to "hippyland" seems less countercultural than it was in its heyday, but it's still useful for business listings, maps, and a user forum. Steven Pemberton and Astrid Kerssens wrote this straighforward, succinct, and informative guide. This independent site (not to be confused with the country's official tourism site, Holland.com) covers the basics with a short guide and related articles. The Netherlands Board of Tourism invites you to discover Holland with its "16 million people and 16 million things to do."